Premier network of stone fabricators in North America. 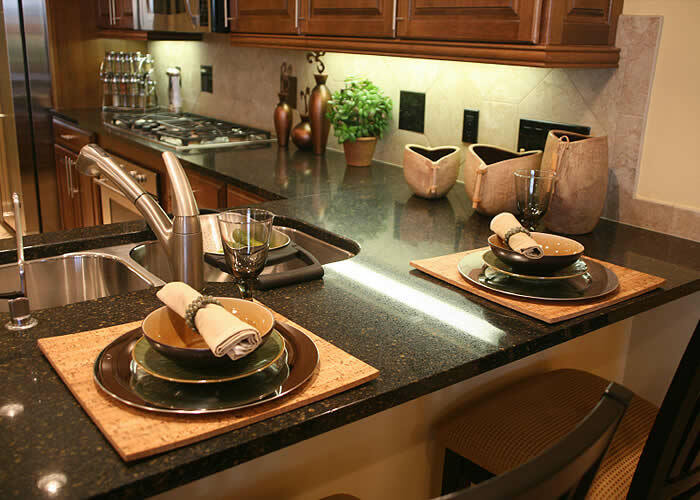 Our extensive network allows us to offer the world\'s best granite from the best sources around the globe. Description: This classic black granite is accented by faint, silver-gold hues that vary in intensity and add immense depth to the piece. This superb, pure black stone has a timeless look that is sure to never go out of style. Description: This gorgeous stone is medium-brown overall with khaki, brown and black mineral deposits. It is a fairly consistent stone with a medium pattern composed of circular flecks and a sprinkling of green and amber. Description: This exquisite stone has a dark black overall appearance, with surprising hints of pearl, blacks and silvers. It is a masterpiece that will look classic for a lifetime. Description: Waves of soft lavender, grays, garnets and gleaming mica are lost within Kashmir White granite. The light color and subtle veining present in this stone ensure that it will be a classic for many years to come. Description: Depth and diversity are added to the simple black color of Sapphire Blue as reddish-tan spots and bluish-white particles drizzle over this unpretentious piece. Description: Tan Brown is a uniform, minimal, yet awe-inspiring stone. Tans, grays, reds and browns form a kaleidoscope of color that unite to form this modest, yet glamorous stone. Description: The uniform brown shades of Tropic Brown are intensified by glimmering flakes of mica and obsidian that jump out and beautify this simple, yet alluring stone. Description: A very extravagant piece of stone, Uba Tuba is dark overall with rich, intermediary shades of black and green. Subtle gold veins swirl around the uniform crystals giving this piece a rare, beautiful appearance. Description: New Venetian Gold is a breathtaking piece of stone that has a consistent, light, honey-golden tone. Subtle veining and movement add to the intensity and small, beautiful amber, white and black flecks complete the masterpiece. Description: Named for the mix of red wine color tones, Bordeaux has vivid quartz deposits that are dispersed throughout this granite’s rich hues. Random black and smoky-gray quartz veins wind through the stone, adding to its exotic allure.